The low temperature yesterday morning was 37° and we had a 48 for the low this morning. Both of those were very nice and the 10 Day forecast is guessing that there will be 10 more of them. That is the good news, the bad news is that the high temperatures will now be in the mid to upper 80s with a 90 in the forecast for this Friday. Patches does not DO 90s and does not like upper 80s. She was doing the 'poor me, tongue hanging out bit' the past two days with it at 79. It is tough to please everyone in this household when it comes to what temperatures should be for a walk. I finally arrived at a solution for drawing 3(2).4.3.4 (also called a Snub Square) when I saw within the pattern a shape that was NOT the tile. What I saw was a STAR. 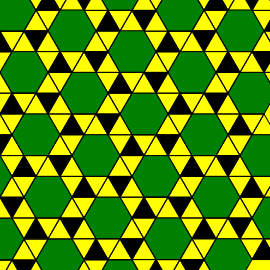 If you will look at the top left corner of the pattern you will see two red squares on a diagonal. If you look to the right you will see one positioned horizontally and has a yellow star point attached to each side. Then on a diagonal toward the top left you will see that there are two more stars. If you look at the diagonal below those stars you will see a line of squares that are tilted to the left. I learned a lot while drawing this pattern. The most obvious lesson was to look past the shape(s) of the tile and look for patterns within the overall pattern. Second, I knew that I could have a shape within the borders of Canvas that would 'lap' over the edge and Canvas would not show that portion that was outside the lines. What I found out by accident (I simply tried it) was that I could place the center of a circle that I was using to draw my shapes outside the lines. Sort of a coloring outside the lines or thinking outside the box moment. I can use a negative 'x' or 'y' coordinate or have a positive 'x' or 'y' that is outside. This drawing might(?) have also weaned me away from the habit of trying to draw these patterns by starting with the borders as if I were putting a jigsaw puzzle together. They look like a puzzle but I can not draw them that way. Hillary Clinton’s Emails Now Might Finally Take Her Down by Dan Metcalfe is a well written article . Metcalfe is registered Democrat who has long said that he will vote for Hillary Clinton in November “if she escapes indictment and manages to become the Democratic presidential nominee.” He also believes that she should be indicted; recommended read. And you get that only one way: 1) Clinton gets indicted as she ought to, but not until shortly after the convention; (2) the evidence presented in the indictment (as well as that proffered to her and her attorney privately) overwhelmingly proves to her that she in fact has bigger concerns in the coming months than running for the presidency; (3) Clinton is thereby forced to step down as the nominee (a difficult prospect to conceive of, to be sure); (4) the Democratic Party (translation: President Obama, as its leader) declares an “unprecedented” emergency and asks everyone to rally around a replacement ticket; and (5) slyest of all, the Democratic Party asks Senator Sanders to please not fight this, which he could not so easily do anyway once his “clout” is dissipated upon the convention’s conclusion. When we went for our afternoon walk yesterday we were on our route near the Petro truck stop. I noticed a van and trailer that I thought I recognized and sure enough it was kaBLOONie at the Park filling his water carriers. He suggested that we let Coffee Girl and Patches run in the Park and I did so without giving it a lot of thought and there was no one else in there at that time. A few minutes later we are talking as the dogs are running and I look to see where Patches is and she is approaching a woman that has entered the Park with a small dog. I knew what was going to happen but it was too late. Sure enough Patches wanted to meet the dog and the woman thought she and her dog were under attack. She grabbed up her dog which only made things worse because now Patches wanted to stand up to see the dog. I apologized to the woman and she went on her way. On her way to get her husband that would not accept an apology. I have no idea what he wanted from me but I could not give it to him. I apologized, I groveled and nothing appeased him so I finally just walked away and that was the end of it. Not a good walk for me although Patches enjoyed it. I can not get the incident out of my mind. I am thinking that perhaps I am getting too old and non-attentive to be responsible for a dog? I'm thinking perhaps Patches would be better off with someone that has other dogs that she can learn to play with? I'm thinking that she may be better off anyplace but with me on the road living as I am? Maybe these thoughts will pass - then again maybe they will not? I finished a quilt block yesterday that I had started some days ago and then got distracted. It was a block that was relatively easy to draw now that I have learned some things from the Geometric Design lessons. I'm not sure that I could have drawn it before going through the lessons I have. There were too many angles that were not 90s or fractions of 90s that I could not do before now. I also made a good start on drawing circles inscribed inside a triangle, pentagon and octagon. These were the shapes, other than a circle segments, that were to have circles drawn inside them in the latest lesson. The hardest part was finding formulas for the incircle radius and for the centroid. Yesterday I found how to compute the radius and then just through trial and error (and eyeballing it) found a place that looked like it was the centroid. Today I found how to compute the centroid and the computed numbers were within one or two pixel of what I eyeballed except for the octagon. The formula did not appear to work with it giving me a centroid that was 'off' by 2-3 pixels which drove me nuts until I finally said enough is enough and used my eyeball placement. I read this book on Kindel downloaded from Gutenberg Project but what the Customer review that I copied says holds true. As the reviewer said there are a few of the stories that are not so great but not so bad. Overall this book was better than the previous ones that I have read by Wells although I don't know that it has made me a fan. I will read more by him that are available at Gutenberg. I went to the Sierra Vista library online yesterday and downloaded the 3rd book in the Great War Series by Harry Turtledove. I didn't want as much time to pass before reading book three as I did between the first and second. I now have most of the characters still in mind. Finished drawing the circles inside the shapes for the Circle Lesson. They do not merit a showing on the Home Page, nothing much different than what I did with the circle segments. Now it time to move on to a more interesting design that incorporates what I might have learned. Another shopping day but I changed the timing a little. I arrived at Smith's a little early as I usually do and was going to wait but looked across the street and saw that Rosies Laundry was open. Went over there and got a load in the washer before Smith's would have opened. The only things that Rosies has going for it are that it is across the street from Smith's and there is an attendant on duty. What it does not have going for it are hot dryers. The first time I was there I got one that did not dry at all, the one today was very marginal - certainly not hot. If I were to do laundry here in Grants again I would give Capri Laundromat on north 1st a try. I had a long list, long for me, of stuff that I needed from Smith's this morning. Not just my usual weekly items that I knew where they were so it took me a bit longer to do my shopping today - but not much. When I left there I gave El Cafecito another try. This time I had their omelet which was so-so. This seems to be THE place, maybe the ONLY, place to have breakfast in Grants. They had a full parking lot at 8:45 when I got there and almost full when I left. I can not recommend it. Another sign of my inattentiveness this morning. I was very low on fresh water and did not notice until the pump started sucking air. Went out before breakfast but after our walk and did the holding tank dumps and took on fresh water. I would like to say that the not paying attention was because I have been thinking about what to do with Patches a lot. But that is a cop out - it was not paying attention to her that caused the problem that now has me obsessing about what can I do with her. No! I think my not paying attention is simply that I am getting old and not paying attention. To draw the lines I have learned a lot about connecting arcs to form curved shapes. I also learned a few things about adding fill color. A few more tweaks and I'll show the finished drawing tomorrow. One more positive thing did happen, I received a package of hulled barley which is harder to find than pearl barley in the stores where I shop. It is ironic that I ordered it from Nuts.com with nuts being where I think I going. The Bureau of Labor released their non-farm job numbers for May yesterday that showed an increase of 38,000 jobs - far, far below expert analysts' estimates of 158,000. The most-pessimistic among them estimated there would be 90,000 'job created'. So much for the expert analysts estimates. I read through the News and did not find a lot of headlines by the Ministry of Propaganda. The few that I found were focused on making excuses for the very poor number. They could not even muster any spin for the great News that the unemployment rate fell because they now know they will be called on it with the huge increase in the Not in the Labor Force. The CES Birth/Death Model added 224,000 this month which is 7,000 more than the adjustment made for May 2015. How can the BLS do this in good conscious and moreover the Ministry of Propaganda to ignore it? What few jobs were 'created' in May were ALL due to the CES Birth/Death adjustment as were the jobs increase in April. If you look at the Household Data the number of Employed increased by 26,000. Certainly not a strong jobs report. The Unemployed decreased by 484,000 which would have been Great News. But, they did not find a job, they were part of the 664,000 increase in the Not in the Labor Force. This combined to drop the Unemployment Rate by 0.3% to 4.7% a level that we have not seen since November 2007. Does any one, other than the BLS and President Obama, think that the employment situation is a good now as it was then? The Participation Rate fell by another 0.2% to 62.6%; the increase in March was good News that received a mention by the Ministry - this decrease and the one last month has been ignored for the most part. The Not in the Labor Force now stands at 94,708,000, another new all time record that exceeded the 94,610,000 set in September of last year. The average earnings increased by 6¢ to $25.59 an hour while the average workweek lost 0.1 hours to 34.4 hours. This is bad news for the Federal Reserve but I think they are going to raise rates again by another .25% and spin the bad job numbers as being an aberration. Everything is Great! I have continued to give the "Dog Park Incident" (sounds like a book title) more thought. Where that thought has led me is back to November 8, 2011 when I wrote this. "I think I may have made a BIG mistake in adopting a dog. I'm thinking that I'm not really cut out to have a dog for a companion. It is very sad that Patches has to be caught up in my failure." The easy option at that time would have been to take her back to the animal shelter where I got her and say I'm sorry but it just is not going to work out. Now because of my emotional attachment to her to give her away or to return her to a shelter while I'm still living is not the easy option. The harder option is to make certain, as certain as is humanly possible, that an 'incident' like this NEVER happens again. I am convinced that this one, or one like it, could have her killed. Someone that is in fear of their life, perhaps unreasonably so, is justified in killing a dog that the insurance industry has classified as an aggressive breed. The dog need not be aggressive at the time they simply need to be of the breed and instill fear. Patches is who she is - she is not going to change her breed, she is not going to change from being a dog, she is going to instill fear. Therefor I MUST do whatever I can to keep her from getting killed - must live with my mistake - it is not her fault. Since it has warmed up a bit with the high temperatures in the upper 80s and the forecast is for low 90s thru Thursday I have modified our walks. This is to keep from killing Patches myself due to the heat. We now start a few minutes earlier in the morning and walk a little longer then do no more that 1.5 miles in the heat of the afternoon. 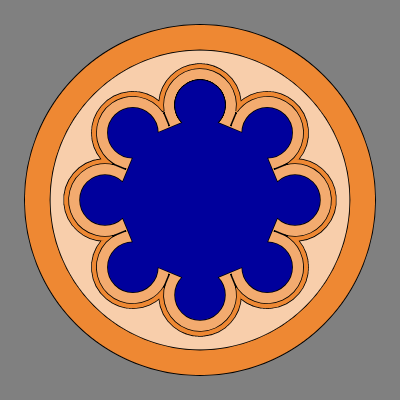 I finished what the Circle Lesson calls a Rosette Window . They then go on to say "This is a window from the West front of Chartres cathedral, and the oldest in the building." It is part of the oldest of the three 'rose windows' but there are windows other than those that are older. 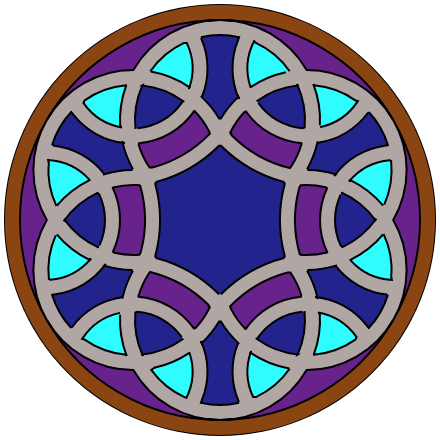 This is also only one of 12 in a ring of them around the outside border of the rose window in the West front and are more properly called roundels. I have just a little bit or touching up to do on it and will be including it on the Home Page tomorrow. Started drawing another tile block but could not keep my mind on it and concentrate. Threw in the towel and took a break by reading more of my latest alternative history on the Paperwhite. I remembered that the insurance premium was coming due on Desperado so went online and payed it this morning while I could remember to do so. It is not due until 19 June but I have become so inattentive that I thought is best to pay it now. I'm sure I have a snail mail notice waiting at my UPS Store but have not received an email notice and probably will not. I also made up my 3x5 route card to the next camp and selected a possible breakfast stop. Built the route map as I have done the past few moves knowing that I may have to change it. That is about all I can handle for today. Yesterday I said "I have just a little bit or touching up to do on it", that being to the Rosette Window. Well by the time I finished with the route map I didn't have much enthusiasm for doing any touching up. It is good enough and anything more I were to do to it would be wasting my time. Speaking of wasting time. I did most of that while laying on the couch reading my Paperwhite for the rest of the day yesterday. Did not even glance at the News. I'm depressed enough without adding what the Ministry of Propaganda has to say. I did notice that the Drawing Archive pages are not being shown correctly by Firefox. They are fine when viewed with IE so I don't want to waste time and effort trying to find out what is wrong. That 'feature' has been eliminated from my Home Page. It was a good thing that I did not want to do more Internet browsing. NetWorx said I had reached my daily limit by the time I finished doing the route map, posting to my web site and reading my Daily blogs. Shut down for the remainder of the day. I did find this article today Janet Yellen Speech Suggests Fed Will Rethink Interest-Rate Plans which seems to take an interest rate hike off the table in June. One of the primary purposes of the Federal Reserve is to conduct the nation's monetary policy by influencing money and credit conditions in the economy in pursuit of full employment and stable prices. I think Yellen knows that the BLS Unemployment Rate is not an accurate gage for 'full employment' but can hide behind it. She has now also made it policy that stable prices are defined to be 2% inflation which will allow the government to pay off its 30 year debt issues with dollars that buys 1/2 what they do today. The amazing thing - people are willing to buy that debt. "If incoming data are consistent with labor market conditions strengthening and inflation making progress toward our 2 percent objective, as I expect, further gradual increases in the federal funds rate are likely to be appropriate,” she said in an advance copy of her remarks to the World Affairs Council of Philadelphia. “I see good reasons to expect that the positive forces supporting employment growth and higher inflation will continue to outweigh the negative ones,” she said. That is what Yellen had to say but what the Administration thinks is expressed well by White House Press Secretary Josh Earnest when speaking to CNBC. Everything is Great! I've been reacting to jobs numbers here at the White House for more than seven years, and what is true today has been true in the past, which is, we don't get too excited when jobs numbers are better than expected and we don't get too disappointed when jobs numbers one-month are lower than expected. I then made a good start on drawing the Seven-Circle Knot (Rose-Shaped) from the Knots and Weaves Lesson. This is going to take a few days if the start is any indication. This may also be special enough that I'll show it if/when I get it drawn. The knot will be difficult but showing it colored for a cloisonné effect will be a separate effort and a separate drawing. It was over 90 again yesterday for the third day and we have three more in the forecast. The guessers think it will then cool down about 5-10 degrees into the upper to mid 80s. My next camp is a bit better, forecast highs about 5 degrees cooler that what is forecast here with an 82 expected for my arrival day. Nothing much different happening here. Although I did go to John Brooks market which is almost next door as opposed to driving to Smith's in Grants. I was able to get what I needed although not everything I wanted. Went to El Rancho Café again after shopping and found them open. Tried their Huevos con Chorizo this time and was much happier than the first visit. Before doing my shopping I went to the Petro station and filled up with gas so I have that one pre-leaving chore taken care of. Upon my return to the Park I also took care of the holding tank dump and added fresh water. It is a week early to be dumping but I did not want to mess with moving Desperado again before I left. As I predicted the Seven-Circle Knot (Rose-Shaped) from the Knots and Weaves Lesson is going to take some time. I almost finished the line drawing for it yesterday but could not fill with color. It is now going to take a couple of days to re-code that line drawing so that it can be filled. I suspected that would be the situation when I began but wanted to do the line drawing for the learning process - lots, of connecting arcs and partial arcs. I had a brief visit with kaBLOOnie yesterday around noon. He was leaving the area for his next camp after getting Coffee Girl "groomed/shaved' for the summer. I don't think that Grants/Milan has a lot of services but he managed to find a few that he was in need of and the groomer charged a very reasonable price. The 'line' drawing for the Seven-Circle Knot (Rose-Shaped) that I have managed to do is close to what is shown in the Lesson. There may be a way to make the lines continuous but I have yet to discover the coding that will do it. I have now also completed the 'filled' version but again it is close but not right. Celtic and geometric knots are connected, to make a continuous intertwined line; that continuity is what I have not yet achieved. Predicting the Efficacy of a Coming Revolution by Jeff Thomas is an article that has been re-posted on a number of blogs but I think it originated here. It is good article from which I have selected his closing to quote. Many in the US talk of revolution. Most hope for a soft revolution, in which their country would go back to the good old days of traditional values, hard work, the rights of the individual and a productive society. Not likely to happen, I’m afraid. The first American Revolution resulted in that very outcome, but that was (in my opinion) because the colonists had no entitlement society to begin with. They went to America as pioneers and each was his own champion. They therefore accepted hard work, self-reliance and treasured individual rights. After the revolution, the US went into a long, highly productive period because the great majority of Americans shared this view. Once the concept that your neighbour is obligated to sacrifice his freedom to satisfy your needs or desires is ingrained in a people, it’s virtually impossible to remove. If we seek true change, we’re only likely to find it in locations that are truly starting over, without the baggage of an entitled population to mire the rebirth of the new regime. With any luck yesterday was the last one that I will see at 90° or more for a while. Today is forecast to drop down to 80 which will seem like a cold spell after this past week. My new camp has a 10 Day forecast that includes a couple days in the 90s but I hope they are wrong. What we also got yesterday was the thunder storm that was forecast for today. Only enough rain to muddy up Desperado and make me thankful that I did not wash it while I was here. It was mostly VERY strong winds which I think were much stronger that the official 40 mph. It broke off tree limbs thicker than my thumb and shook Desperado harder than other 40 mph winds that I have been in. Doing housecleaning chores this morning in preparation for the move next week. That and still trying to draw the Rose Knot as shown in the Geometric Design Lesson. I am now trying to do the cloisonné effect and hoping that will show me how to do the knot also. Finished most of the housecleaning yesterday. Today I clean the car part of Desperado; the dash, cab windows inside and out plus the outside mirrors that are mud spattered. The last thing to do will be the kitchen stove top and counters after 'linner' tomorrow. One of the things that I wanted from Brooks was Greek God Honey and Vanilla but would have settled for almost any Greek God. What I picked up was what I needed which was Oikos Vanilla Greek yogurt by Dannon. I have added a little more vanilla to it and it is pretty good. I think it is thicker than Greek God and has slightly less sugar. However, all the sugar comes from processed sugar or fructose whereas most of the sugar in Greek God comes from the honey. If you find that you can not get what you want, Greek God, then I can recommend Oikos as what you need. I did much better drawing the Rose Knot with the cloisonné effect and it looks like what is shown in the Lesson. I'll post it tomorrow or the next day. My condolences to the families of those killed in Orlando. However, they ALL did not need to die. There were 300 people in the club when the shooting started and no one was armed to shoot back or if armed were to cowardly to do so. Even unarmed there were 300 people that did nothing while the shooter re-loaded 10 times or more to kill 50 and wound another 50. The Lame Stream Media is wringing their hands and asking why was the 'nightclub' targeted and are having a difficult time spinning the story. Can you think of a softer target? A 'safe place' that is a 'gun free zone' with 300 targets that will not fight back - it was like shooting fish in a barrel. It has shown the Islamic State how weak the US of A and its people are and I predict they will use it as a blueprint for more attacks on soft targets. We're led by a man who is a very -- look, we're led by a man that either is, is not tough, not smart, or he's got something else in mind, and the something else in mind, you know, people can't believe it. People cannot -- they cannot believe that President Obama is acting the ways he acts and can't even mention the words radical Islamic terrorism. There's something going on. It's inconceivable. This is the Rose Knot drawn with a cloisonné effect. It used most of the same lines as the Rose Knot but does not show the over and under of the 'cord' as the Knot does. I was able to fix what I showed yesterday easier and quicker than I thought. My idea worked and I have changed what was shown before. The next drawing in the Lesson will be ever bit as difficult as this one was but maybe I have learned something. It is another Knot but this time it will be inside a circle. It will be shown two ways again; as a Knot and as a Knot with the cloisonné effect. I think I'll take a breather before trying to draw them. 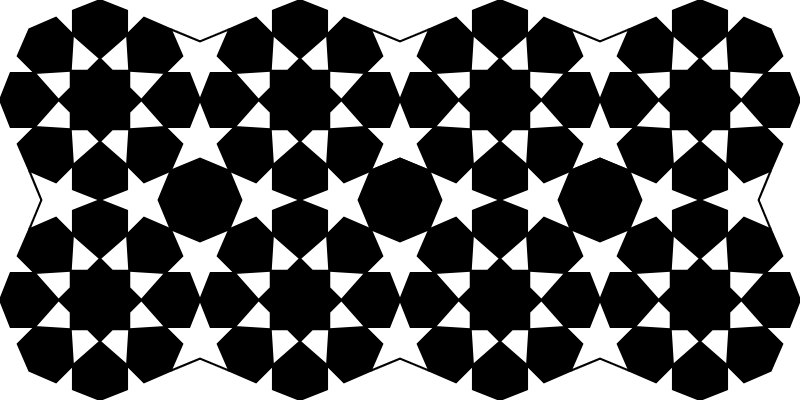 As a break from the Geometric Design Lessons I worked on the last of the 8 Uniform tilings 34.6 or the Snub Hexagonal Tiling. This is 4 triangles and one hexagon in each tile but when I drew it I had 7 triangle and the hexagon grouped together with two of the triangles filled with color, the other 5 were outlined and the background provided their coloring. I have not finished it yet but it is looking very good. I may post the final drawing tomorrow. Or, maybe not - I don't know. I'm always a little late getting my posting done on moving day but today I'm at least an hour later than usual. I stopped for breakfast at Granma's in Crownpoint, NM as planned. What I did not plan on was taking a scenic tour of Crownpoint first. If you are looking for her restaurant, and approaching from the south, do not turn when you see a sign pointing to Crownpoint. Wait until you see Basha's and/or Navajo Route 9; the restaurant is in that shopping center. Stopped again at Summit Shooting Center on the southern edge of Cortez. I sent them a message using their web page Contact Form and received no reply then sent an email to the address shown on their web page and got a Non-delivery Message. The web page says that the place is for sale so I thought they might be out of business but they are open. Just trying to avoid any new business by not responding to anything except the telephone and in person drop ins. I'll be going back and use their indoor range. Then a shopping expedition at City Market in Cortez took the usual long time when I first go into a new to me market. I did get everything I wanted except white vinegar which I can live without until next week. That is my all purpose cleaning solvent which I used the last of these past couple of days. My new camp is small and I have a tight back-in space that should become easier to get into after a few more times. It is near downtown which is a strip of businesses along the main highway which I am also near but traffic noise will not bother me. I'll have more to say about the Park but the owners were great today when I checked in. The route was only 218 miles: E. Pinon, NM122 (Historic US66), County 19*, Cassamero Lake Loop Rd (Navajo 48), NM371, Navajo 9, US491, US491/US160, US160, CO145 & Central Av. *County 19 is not a very good paved road but it is better than the dirt/gravel it becomes when it enters the Navajo Reservation. I drove 6 miles of that to Cassamero Lake Loop Rd which saved 6 miles versus staying on NM122 until NM371. It is a scenic drive but now that I have done it I need never do it again. High cholesterol 'does not cause heart disease' new research finds, so treating with statins a 'waste of time' by Henry Bodkin says it all in the title. But I have pulled select bits from the article to quote. Any one that is over 60 that is on statin drugs needs to read this and take it with them on their next doctor visit. That is when you tell him/her that you have quite taking statins. The drug companies had their toadies promptly challenge the study of course but I found the side effects too painful to keep taking what I now consider to be poison. I found a good walking route yesterday afternoon and this morning which I can probably turn into 4 different routes. I also found a coffee shop that opens at 6:00 where I got a latte fix this morning. They will be getting more of my business while I am here. I also found a restaurant that the Park owner recommended that opens at 6:30. Dolores is exceeding my expectations so far. I do not have a weather reporting station that is very close but the one that I will use is reporting a high yesterday of 81 and a low this morning of 49. Those are temperatures that I can live with. Unfortunately, starting on Sunday I will be living with highs in the 90s which is not so good. At 7,000' I was hoping for better but there are worse places I could be starting Sunday. Steve gave me a compliment in his Shout when he said "I haven't seen anyone on the media tell it like you did." That is still true but there are others out there that think as I do. The picture and caption say what I did using much fewer words and is more effective in getting the message across. I also have found You MUST Change Your Attitude by Karl Denninger that is an article which should be required reading. I quote only a few passages although I could quote the entire article - it is that good. Second, the radio call to the cops from dispatch has been published. The cops were told to take cover and not storm the building immediately despite knowing there was a man with a gun inside the building actively shooting people -- and they did exactly that, waiting three hours while people who had been shot were bleeding out on the floor. READ THIS CAREFULLY FOLKS AND DO SO REPEATEDLY UNTIL IT SINKS IN: The cops, with overwhelming force that they demand the right to possess and use at their whim while at the same time they refuse to allow you to have and possess defensive firepower on your person in the very same situation and place, cowered outside in fear and let the patrons who had been shot and were being shot die. Again: You must internalize the view that if confronted with such a situation you are already dead and you, and only you, have any possibility of changing that outcome. The reason for this is simple: If you are already dead then any act you undertake can only improve the outcome. It cannot make it worse, because the worst possible outcome has already happened. The weather station that I checked for temperatures here in Dolores is some distance from town and I think has higher highs and lows than what I am experiencing. The Dolores State Bank has a Time and Temperature sign that was showing a 5° lower temperature than what the station had recorded. It felt colder than what the Bank was showing because of a slight breeze and my wind breaker was not breaking very well - 41° per the Bank. Yesterday afternoon I found another restaurant that opens at 6:30. Then this morning went past one that claims to open at 6:00 that was open but I do not remember it being open yesterday when I went past it. The Park owner did not recommend it for lunch/dinner but said that she had never tried breakfast. There are three that I can try and then there are always those available in Cortez but that is a busy town that looked to have limited parking at all businesses. This was the last in Turtledove's The Great War trilogy. If I were make any recommendation it would be to read them one after another with little time between them. It is hard enough to keep the characters straight in your mind without letting too much time pass between books. Taken together they are a good story if you can get past the alternative history aspect which is not something that everyone can do. I'll be reading more of his books. Obama’s tantrum a striking display of failed leadership by Michael Goodwin is a good critique of President Obama's failed speech that attempted to counter The Donald's criticism of his Islamic terrorist policies. It is a good article. Obama’s demeanor and tone were far from presidential — tantrums rarely are. Nor was he effective in rallying the nation to his cause. No surprise there. His cause is himself, always and only, and his greatly diminished historic presidency looks especially insignificant next to the bloodshed in Orlando. The iconic redeemer who promised hope and change never seemed so small and hopeless. Forty-nine innocent people were gunned down in a gay nightclub by an Islamic terrorist, another 53 lie wounded, yet Obama feels only his own pain. Public confidence in his effort to combat terrorism on his own peculiar terms while soft-pedaling the links to Islam were among the casualties in the Pulse nightclub. The world knows he’s a failure and he can’t stand the embarrassment. So he lashed out at Trump, who dares not only to point out the obvious, but to rip away the veil of euphemism as he lunges for the jugular. The Discovery of the Future is a 1902 philosophical lecture by H. G. Wells that argues for the knowability of the future. It was originally delivered to the Royal Institution on January 24, 1902. It is a very short book which could have been included as a chapter in Anticipations but that was published in 1901. He covers much of the same ground here that he did in parts of that book. Because it was such a short book I have downloaded another one of his from Gutenberg Project. For my afternoon walk yesterday I went out and back on County Rd 31/526 for a mile. The first half mile was in Dolores and flat then I started up for the second half mile which I think was a climb of a little over 300'. I was feeling it by the time I got back to Desperado and have a sore right knee this morning. I need to do that walk 2-3 times a week - Ya Sure. It is as I suspected with the drawing a knot in a circle. It is going to take me much longer to draw it that the previous knot and I don't know for sure that what I am doing is going to work. I'll keep at it and hope for the best. I don't know when I'll be able to post this. Verizon died yesterday around 2:30 and when I finished my afternoon walk I asked the Park owner for their WIFI password. He said that the WIFI was down also. I did not ask, but I now think that their WIFI is probably just a repeater of what they get from Verizon and it will be like most RV Park WIFI - very poor. Verizon did come back up when I tried it after 5 hours but as soon as I tried to check e-mail it went down again. I gave up and went to bed. This morning I tried the Park WIFI first and it was not available. I was surprised when Verizon did come up. I guess the Park needed to do some resetting of their repeater and they do not get started very early in the day doing anything. I am going to 'peddle some fiction' and let you make up your own mind. Although the President was peddling a half truth when he said "right now". 1. Industrial production has now declined for nine months in a row. 2. U.S. commercial bankruptcies have risen on a year over year basis for seven months in a row. 3. U.S. factory orders have been dropping for 18 months in a row. 4. The Federal Reserve’s Labor Market Conditions Index has been falling for five months in a row. 5.The number of temporary workers in the United States peaked and started falling precipitously before the recession of 2001. The exact same thing happened just prior to the beginning of the 2008 recession. The number of temporary workers in the United States peaked again in December 2015 and has fallen dramatically since then. 6. The employment numbers that the government released for May 2016 were the worst that we have seen in six years and ALL the jobs added were due to the Birth/Death Adjustment. 7. Over two-thirds of respondents with a household income under $40,000 report that they would sell something or borrow money to cover a $400 emergency expense or could not cover the expense at all (Federal Reserve Economic Well-Being of U.S. Households, 2014). It was probably worse in 2015 and "right now". Furthermore, if you define 'poor' in terms of Net Worth then there are more 'poor' in the good 'ol US of A and Europe than there are in China. Credit Suisse, in their Global Wealth Report 2015, estimates that half of the world has a net worth less than $3,210. And a large chunk of Americans and Europeans can’t make that cut because their net worth is negative. If you have $10 in your pocket and no debt you have more wealth, you are 'richer', that 25% of ALL Americans. I finished drawing all the shapes that go into making up the cloisonné-type Knot In A Circle late yesterday. Today I will be filling the shapes with colors that will make it look very much like what is in the Lesson. Probably show it in my posting of tomorrow. It is a piece of art if I do say so myself. 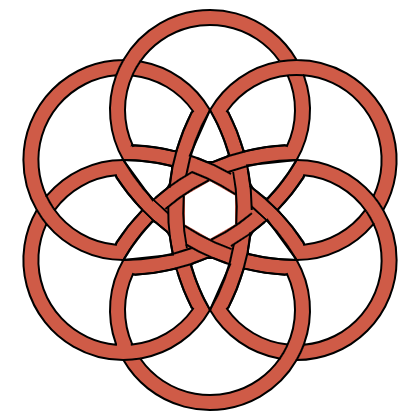 I will also be starting on the drawing of the Knot In A Circle with the 'cord' going over and under itself on a continuous path with no beginning and no end. That is going to take some time but I not as much since I now have a lot of it drawn. Drawing, reading and trying to stay cool is the plan for the rest of the day. Downtown Orlando has no bottom. The entire city should be leveled. It is void of a single redeeming quality. It is a melting pot of 3rd world miscreants and ghetto thugs. It is void of culture. If you live down there you do it at your own risk and at your own peril. If you go down there after dark there is seriously something wrong with you. All Orlando nightclubs should be permanently closed. With or without random gunmen they are zoos. 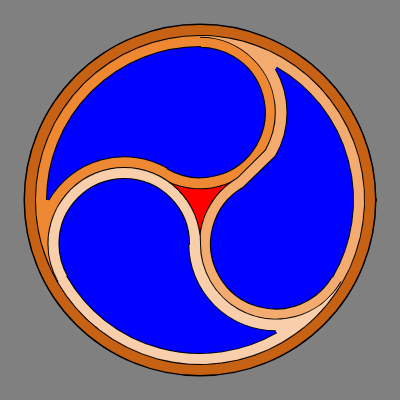 This is the Knot In A Circle done with a cloisonné effect. It was a lot of work and a lot of coding but looks like what is presented in the Lesson and may be even more colorful although I did stick to the color scheme used in the Lesson. The lot of work included the 6 narrow purple shapes along the border, 18 triangles in dark and bright blue, 6 arrows in dark blue, 6 rectangles in purple and dark blue center. The background is gray so with those shapes drawn the Knot then shows through as gray. I have almost finished the Knot In A Circle which has the 'cord' passing over and under itself as well as the loops that are tied to the brown border. It is a good looking drawing as well and I will have it posted tomorrow. I'll then take another break from the Lesson and go draw some more tilings. 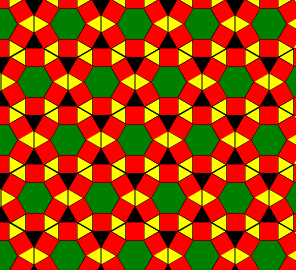 I now have my sights set on the twenty 2-uniform tilings of the Euclidean plane. Today is forecast to be the hottest during this period of scorching temperatures. It is expected to be 95° here today then start to cool down into the high 80s by Friday. The weatherunderground station that I have now found is located almost across the river from my Park and they reported a high of 90 yesterday. The highest temperature that station has reported during the past year was 92.4 so a 95 is not unreasonable. Salon is ranked in the top five liberal websites but even they have published a criticism of The Hill's criminal behavior. This quote was included in Kunstler's blog posting of today but was in the Salon article The cash donations Hillary simply has no answer for by David Sirota from over a year ago. He gives her a break and questions her judgment but what she did was criminal in my opinion. We may hear more about this from The Donald as the campaign heats up. Under a directive signed by President Clinton in 1995, the State Department is supposed to take foreign governments’ human rights records into account when reviewing arms deals. Yet, Hillary Clinton’s State Department increased approvals of such deals to Clinton Foundation donors that her own agency was sharply criticizing for systematic human rights abuses. That year, the Algerian government donated $500,000 to the Clinton Foundation and the next year Clinton’s State Department approved a one-year 70 percent increase in military export authorizations to the country. The jump included authorizations for almost 50,000 items classified as “toxicological agents, including chemical agents, biological agents and associated equipment.” The State Department had not authorized the export of any of such items to Algeria the year before. I had another big spike in Verizon data usage yesterday morning. This was then reflected by my NetWorx meter in the afternoon when I went from 100% of Daily quota to over 200% while I was on the couch reading. There is something going on but I don't know what. I had a Chat with Casey at Verizon and it appears to them that I am getting application downloads but I have not seen anything from Windows recently other than their almost daily updates to the Spam filters. Verizon is to do more research and send me an email. I await. It was 92° yesterday afternoon when I did a shorter walk along the River Trail near my Park. Walked across CO145 and through the town park and then did a couple back and forth walks along the river where I was mostly in the shade. Some people will be saying why not do the walk later. I could have done that but it was 97° at 8:00 (which was also the high for the day) so I am pleased that I went out when I did. This morning I did a wandering route that totaled 2.01 miles, I wanted to do 2 miles and not an out and back route. This was good and it had me finish, unhook from electric and go to That Place In Dolores for breakfast. That is one of the two places that claim to open at 6:30 and That Place did so this morning. They will get some repeat business from me while I am here. Into Cortez and City Market where I got everything I wanted except Greek God Honey Vanilla. They did have Honey and I have my bottle of vanilla so all was well. I asked the bagger where there was a car wash that would do it so me. He had no idea. The Park owner claimed that the second one on the left as I was going west would but they do cars not RVs. I arrived at Summit Shooting Center about 30 minutes early and spent 10 minutes or so trying to get my RV generator to start so I could run the A/C and keep Desperado cool. Could not get it to start and there does not appear to be any RV repair shop here in Cortez. Got into the indoor range early and neither the owner or his wife could help me with the RV wash or repair. My shooting at 9' and 15' is good enough that you would not want to be that close. When I move the targets out to 21' there is only a 50% change that I would do any bodily harm. But there is also a very good chance that no one would want to get in the 15' or 9' range considering that 50% chance. I'll be going back at lest one more time maybe two and hope that it is cooler. 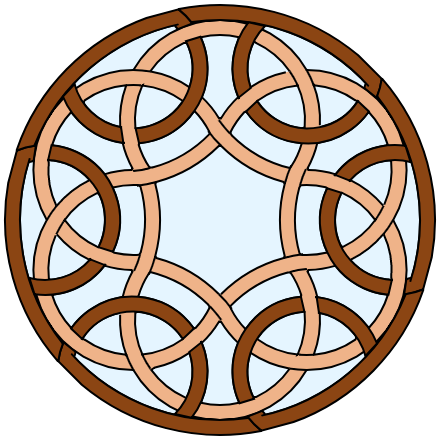 This is the Knot In A Circle which has the 'cord' passing over and under itself as well as the loops that have been tied to the brown border. It was not too difficult to change the drawing from yesterday with the hardest thing being to draw the Loops which are made up of three separate shapes for each Loop. 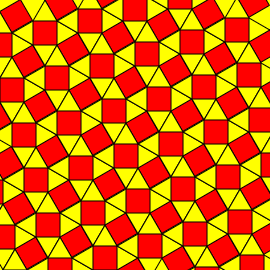 I now have my sights set on the twenty 2-uniform tilings of the Euclidean plane. 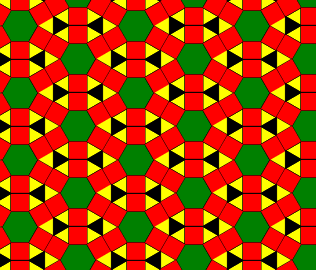 These are tilings that combine one of the 8 uniform tile that I have drawn previously with one or more shapes added. The first one that I am going to attempt will be the 3(2).4.3.4 (also called a Snub Square) that has six triangles added so it becomes a 3(6).3(2).4.3.4 and the coloring scheme will be changed. Made good progress on it yesterday and think I can finish it later today or certainly by tomorrow morning. I did finish 3(6).3(2).4.3.4 the first of twenty 2-uniform tile that I want to draw. 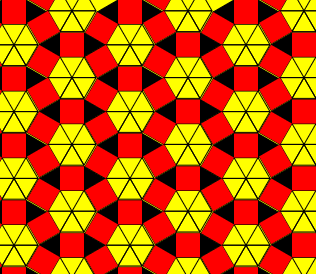 It was easier to do that the 3(2).4.3.4 uniform tile that is its base. But it might be that I have more experience now so it seemed easier. I was going to go back to Knots and Weaves in the Geometric Design Lesson but have no interest in drawing what is shown as a weave. 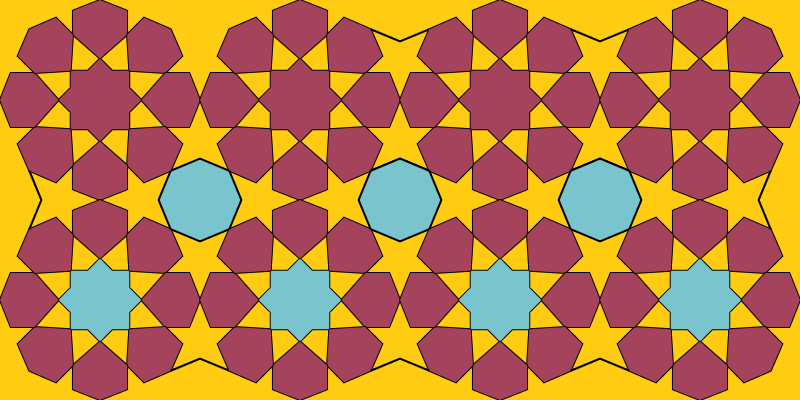 I'll be moving on to the next lesson Two Variations on an Islamic Tiling Pattern and if I ever need the weave I can come back and work through that part of the lesson. As I was leaving Cortez yesterday I saw a number of bicyclist coming in from the east on US160 and turning into the High School. I then saw the route support people putting out signs along CO145 and assumed that Cortez was a lunch stop. Talked to one of the 450 participants in this years Bicycle Tour of Colorado that stopped at the coffee shop this morning where I was having my latte fix and got the ride name and route. It was 25 years ago yesterday that I rode into Cortez on a bicycle but June 22nd of that year was a lay-over day. It was tomorrow that we road to Rico and then for another 5 days through Colorado. It seems like it was such a short time ago, there has been a lot happen in my life since then but that tour and the cross-country tour the year before were life changing events. Such as my arrival in Bulgaria last week - 20 years ago. Trolling for War with Russia by Patrick J. Buchanan is a very good article. He and Paul Craig Roberts are singing from the same hymnal when it comes to what this Administration appears to be doing to provoke a war with Russia and China. Do we really, really want a war with those two countries when we can not win again the goat herders in the Middle East? They are not the only writers that are issuing this warning. Dmitry Orlov has been saying the same kinds of things for some time and recently did so again in an interview that has been transcribed in part as The US Is Sleepwalking Towards A Nuclear Confrontation. The closing to the transcription "There isn’t a happy outcome, there isn’t a face saving outcome for the United States or for NATO. There is just basically the choice between death and humiliation." You might like what Orlov has to say about the Orlando 'incident' also in his blog posting Negative interest rates are coming to America. I have included a quote of only part of what he said. For example, last New Year's eve in Cologne, Germany, a mob of around a thousand male migrants attacked and molested a large number of women. There were some German men on hand; did they defend their women? No, they didn't. Or take the recent incident in Orlando. Conspiracy theories aside, there were over 100 people there against one gunman. Did any of them rush the gunman? The first 10 might have gotten shot; but the next 10 could have piled on, dropped him to the floor and stomped on his neck, ending the incident. But that didn't happen, did it? Where was their killer instinct? It was only slightly cooler yesterday but it did cool down faster after reaching the high for the day. It was in the high 80s when I went for my walk and I did a little more that the previous day but still not doing a full 2 miles in the heat. Trying to do a little longer walks in the cool mornings which are now great. Most books I could find outline this and seem to suggest that, in order to create a pattern, you should repeat this for each rosette on your surface. That is an absurd, time-consuming way of working and has an adverse effect on the overall accuracy. Here you will find the proper method for creating a pattern, which is to draw a grid. Most of the lines will run through the whole grid, even if not continuously visible, so that it all holds together. When working tile by tile, it is much more likely to have many small deviations so that no true lines run through the entire design. To just draw the grid as she has show it would have been done by now. However, I am still a day or two away from having the basic pattern drawn and ready for various coloring schemes. We had a fast moving thunderstorm yesterday in the early afternoon which may herald the monsoon season. It didn't deliver much rain, didn't cool down much either but did raise the humidity some. The weather guessers think there will be some more or the same to come in a few days. The BIG News this morning is the Brexit results and the financial market turmoil that it has caused. I have no comment today but will be following the market activity next week; particularly the gold mining stocks and Hecla. My 'portfolio' may have received an infusion of new life. The only other thing of note was that I got my laundry done in the RV Park laundry room which has two washers and two dryers. Fortunately, I got in there early while most people are still in bed. This is the basic Eight-Fold Rosette Line Pattern that I will start adding fill color within selected areas/shapes of the pattern. The Lesson shows three different colorings that I am going to try an replicate. If I succeed I'll be posting them but if I fail I'll simply admit it and move on to the next part of the lesson. The Militarization Of America: Non-Military Federal Agencies Purchases Of Guns, Ammo, And Military-Style Equipment Fiscal Years 2006 – 2014: Oversight Study Published: June, 2016 by Open The Books documents much of what I have previously written - Federal government agencies preparing for war against someone. The publication is 55 pages in PDF format but I am going to quote 'only' 6 ofthe Key Findings today, I save the other 6 for tomorrow. 1. Sixty-seven non-military federal agencies spent $1.48 billion on guns, ammunition, and military-style equipment. 2. Of that total amount, ‘Traditional Law Enforcement’ Agencies spent 77 percent ($1.14 billion) while ‘Administrative’ or ‘General’ Agencies spent 23 percent ($335.1 million). 3. Non-military federal spending on guns and ammunition jumped 104 percent from $55 million (FY2006) to $112 million (FY2011). 4. Nearly 6 percent ($42 million) of all federal guns and ammunition purchase transactions were wrongly coded. Some purchases were actually for ping-pong balls, gym equipment, bread, copiers, cotton balls, or cable television including a line item from the Coast Guard entered as “Cable Dude”. 5. Administrative agencies including the Food and Drug Administration (FDA), Small Business Administration (SBA), Smithsonian Institution, Social Security Administration, National Oceanic and Atmospheric Administration, United States Mint, Department of Education, Bureau of Engraving and Printing, National Institute of Standards and Technology, and many other agencies purchased guns, ammo, and military-style equipment. 6. Since 2004, Department of Homeland Security (DHS) purchased 1.7 billion bullets including 453 million hollow-point bullets. As of 1/1/2014, DHS estimated its bullet inventory-reserve at 22-months, or 160 million rounds. It was much cooler yesterday afternoon with a lot of cloud cover and a few drops of rain fell while I was walking. Did a little over 2 miles to try and make up for the shorter day that I did when it was so hot. Then did another extended walk this morning 'up' the road to mile marker 12 and back down into town with a stop at Pony Espresso for a latte fix. If I can do a usual walk this afternoon I should be back to my average daily distance for the week. The forecast is for it to be 85° which is a little warm but they also claim it will be Partly Cloudy - that could make it nice. Started to download and format next months Will Rogers weekly articles last night. Will work on them today and probably finish by tomorrow. The Militarization Of America: Non-Military Federal Agencies Purchases Of Guns, Ammo, And Military-Style Equipment; the second set of six Key Findings. As a veteran I was heartened to see that the VA is not 'wasting' its budget and has secured the VA medical centers. You can not be too secure when you have dissatisfied veterans on the VA waiting list. I was also encouraged by seeing that our Federal government did spend more on Tasers than on grenades/launchers. 7. Between 1998 and 2008 (the most recent comprehensive data available) the number of law enforcement officers employed by federal agencies increased nearly 50 percent from 83,000 (1998) to 120,000 (2008). However, Department of Justice officer count increased from 40,000 (2008) to 69,000 (2013) and Department of Homeland Security officer count increased from 55,000 (2008) to 70,000 (2013). 8. The Internal Revenue Service, with its 2,316 special agents, spent nearly $11 million on guns, ammunition and military-style equipment. 9. The Environmental Protection Agency (EPA) spent $3.1 million on guns, ammunition and military-style equipment. The EPA has spent $715 million on its ‘Criminal Enforcement Division’ from FY2005 to present even as the agency has come under fire for failing to perform its basic functions. 10. Federal agencies spent $313,958 on paintball equipment, along with $14.7 million on Tasers, $1.6 million on unmanned aircraft, $8.2 million on buckshot, $7.44 million on projectiles, and $4 million on grenades/launchers. 11. The Department of Veterans Affairs (VA) spent $11.66 million including more than $200,000 on ‘night vision equipment,’ $2.3 million on ‘armor – personal,’ more than $2 million on guns, and $3.6 million on ammunition. Veterans Affairs has 3,700 law enforcement officers guarding and securing VA medical centers. 12. The Animal and Plant Health Inspection Service spent $4.77 million purchasing shotguns, .308 caliber rifles, night vision goggles, propane cannons, liquid explosives, pyro supplies, buckshot, LP gas cannons, drones, remote controlled helicopters, thermal cameras, military waterproof thermal infrared scopes, and more. The weather did not quit match the forecast yesterday afternoon. I think it was hotter than the gurus thought it would be and the Partly Cloudy was more like Scattered Clouds that did not provide much respite from the sun. I did my 2 miles but it was not as pleasant as the almost 3 were in the cool of the morning. I will have the second colored Eight-Fold Rosette Pattern posted tomorrow. It is finished and I have started drawing the third. Almost finished downloading and formatting the Will Rogers weekly articles for next month - will finish that project today. I have also started another 2-uniform tile that is a combination of 3.4.6.4 Rhombitrihexagonal & 3(2).4.3.4 Snub Square which are both included in the 8 uniform tile that I have drawn previously. I could not just copy the coding for each one and put them together however; it does not work that way. I did get some coding written yesterday that I think is going to work and may have the tiling drawn in a day or two; it is an interesting pattern. An Englishman Looks at the World is a 1914 essay collection by H. G. Wells containing journalistic pieces written between 1909 and 1914. The book consists of twenty-six pieces ranging from five to sixty-two pages in length. Some of the essays are good, some are not so good. The one in which he speculates upon the future of the American Population is insightful about who/what an American is but his forecast of our future could not have been more wrong. He was a dyed in the wool Socialist and I am very surprised that the Left does not have t-shirts with his picture on them. But then again the Left likes to preach 'peace and love' but their heroes all seem to have been violent men that obtained power through the use of guns - ironic, is it not? I have downloaded another book by Harry Turtledove from the Sierra Vista library. I wanted to get a Follett book but it has never been available so I placed it on a Hold Listing for me. I have no idea how many people may have also placed it on Hold but I guess I'll get it sometime. Only Politicians Need Firearms for Protection by Joshua Krause has written an article that the Ministry of Propaganda will never publish. He is reporting what we all know but the elite do not want talked about when it comes to gun control. I quote the very good part. ..the same rules don’t apply to the political elite. "Law-abiding citizens just shouldn’t have to carry a gun. You’re not gonna push me in that direction,” he said, standing just five feet from a Capitol Police officer, who stood at his post by the House Speaker’s Lobby. Went to the second restaurant here in Dolores that claimed to open at 6:30. I had stopped before and asked and it was confirmed that the hours of operation sign was correct - open at 6:30 seven days in the week. I arrived at 6:35 and the one guy that was the 'opener' was just showing up. He said yes he opens at 6:30 but it takes 20 minutes for the coffee and the grill to get hot so he really does not start serving until 7:00. Went to the Ponderosa that opens at 6:00 and got a fairly decent Chile Omelet with good hash browns. The waitress acted like she did not want to be there but the service was good in spite of her mien. The shopping at City Market went exceptionally well. I was able to get Greek God Honey Vanilla and found a couple of plastic squeeze bottles that were not on my shopping list but I have been looking for some replacement for a few weeks/months. I was also able to pick up a mouse trap. I think I had her come aboard just before I left Milan and I have provided plenty of opportunities for her to leave. It has now come to my attention that she is probably building a nest so voluntarily of involuntarily she is going to GO. Don't stop at Wal*Mart very often but they do have good prices on their ammo. I needed some more but even more importantly I needed some Hoppe's #9 bore cleaner and cloth patches. That was quickly taken care of and I was backed into my space again by 9:00. My right hip has been paining me some for the past few days and I have been foot sore. With those two excuses, no cloud shade, the temperature at 89° and forecast to reach the mid to upper 90s I did a 1 mile afternoon walk. The forecast for today and the rest of the 10 Day is for cooler highs in the mid 80s maybe even get down into the high 70s. That would be nice! I caught a mouse last night. That is the good news. The bad news is that I do not know if I had a mouse in the house or if I have mice. I guess time will tell and if necessary this intrepid trapper will go into action once more. 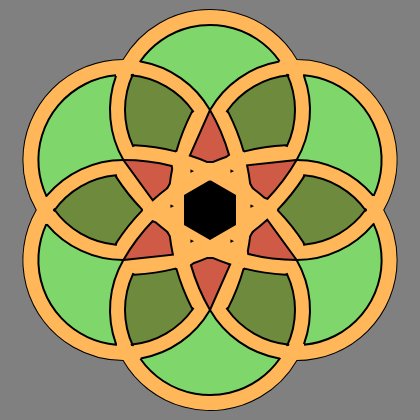 This is the third colored Eight-Fold Rosette Pattern in the Lesson which did require more changes to the previous drawings than I thought but was not too difficult. I have started on the Line drawing for an Eight-Fold Rosette in a Rectangle which is the last in this Lesson. The way it is done in the Lesson is another VERY complicated grid. I am almost finished with the basic Line drawing (no color fill) and I think it was much easier than making the grid. I also learned a couple of things that would have made the previous Rosette Patterns easier to draw but I am not going to go back to change what I have done. That has been true of a lot of the things that I have drawn and I have never gone back. Firing the Elites by Dmitry Orlov is a good article about Brexit and what it means. I have quoted his closing paragraph but all that he has to say is worth reading. And so they need to be fired. If this is to be done by voting (as opposed to, say, from a cannon) then the object of voting is to elect somebody who is, first and foremost, capable of firing these elites. The British seem to have done this; now it is the Americans’ turn. A somewhat thoughtful question that is sometimes asked (after people are done making spurious claims that Donald Trump is insane, a misogynist, a racist, a fascist, a bad businessman, generally not very nice or whatever else) is whether he is qualified to govern. To my mind, this question reduces to a much simpler question: Is he qualified to fire people? And the answer is, Yes, he most certainly is qualified to fire people. In fact “You’re fired!” is one of his trademark utterances. In fact, he just recently fired his very own campaign manager. Hillary Clinton, on the other hand, heads up the entire cohort of people that need to be fired. And that is why I think there is a good chance that the “little people” will finally rise up and vote for somebody who will do just that. There was another thunderstorm early in the afternoon yesterday that didn't bring much rain but it did bring cooler weather. I got to do my walk in high 60 temperatures and it looks like I may get that chance again during the next 5-6 days. That is I can if I take a chance of getting wet; chances of rain are in the 40 to 80% range. I finally found a repair shop in Cortez that is in business and responded to my filling out their Contact Form. Because I do not want to make a special trip, the July 4th Holiday and the days of the week that the shop is open my appointment is not until 15 July. That is not a problem since I have not tried to use my generator for so long that I think that is now what is wrong with it; all gummed up from lack of use. 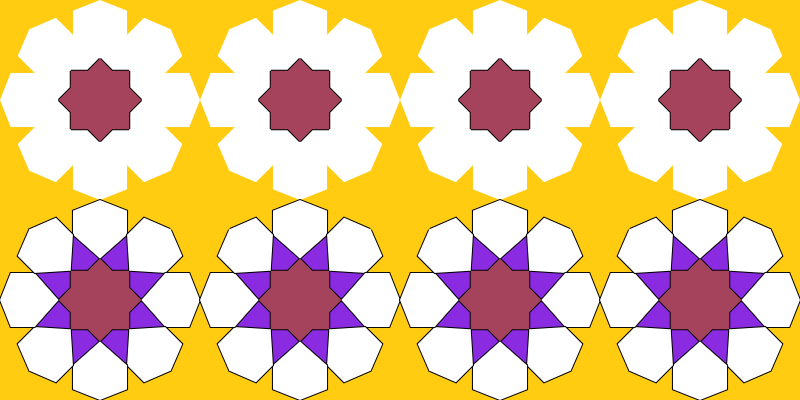 This is the 2-uniform tile that combines a 3.4.6.4 Rhombitrihexagonal & 32.4.3.4 Snub Square which are both included in the 8 uniform tile that I have drawn previously. I have also started drawing the third one in the 2-uniform series that also uses the 3.4.6.4 tile plus 43.32. It has not required many coding changes from this pattern but looks much different until you look closely and/or have them side by side. You have all heard/read about the suicide death of Vince Foster and all the right-wing conspiracy theories surrounding his death. His death is included in this 'list'/article but he has a lot of company. I offer up the link with no further comment, if you read the article you can arrive at your own conclusion - The Clinton Body-Count . The latest addition to the list is John Ashe, a former President of the United Nations General Assembly, that died just a few days before being set to testify against Clinton in a corruption case. We did get some rain yesterday but it was late in the day and I had already finished my walk in the heat. It wasn't too bad at 84° compared to the 90s that we were having. The clouds were just building up as I was finishing so it would have been better to have waited but when I get in a routine/rut I tend to stay there. Got more rain after I went to bed. There was even enough to measure this time although the .07" does not measure up to what most people think off as it having rained. It is overcast this morning and the weather guessers think we have a 40% chance of getting another rain like yesterday maybe another .07". That is still enough to get me wet so my afternoon walk is in jeopardy. This is the other 2-uniform tiling that I said used the 3.4.6.4 but has added a 33.42 and using the same coloring it looks different yet hauntingly the same as the one I posted yesterday. I'll be posting a series of drawings, starting with the Line drawing for a Eight-Fold Rosette in a Rectangle, that will be the last in this Lesson. Then I'll be moving on to a Lesson that has only one subject to draw and it uses many of the shapes that I have been learning. Sort of a test to see if I have learned anything. It is a big project but I hope to have it finished by the time I have shown all the Rosette drawings. A small part of this quote was included in Europeans Contest US Anti-Russian Hype by Joe Lauria. In the article he makes the same point that Paul Craig Roberts, Patrick J. Buchanan and Dmitry Orlov have made; the good 'ol US of A is trying to gin up a shooting war with Russia. It is his contention that Brexit may be the wakeup call that Europeans needed to see that the United States is pushing them into a disastrous war. You will NOT see this story as a major headline by the Ministry of Propaganda because it does nothing to advance their agenda to disarm the population in the United States. However, it is a great example of what was wrong in the Orlando nightclub and what was right in Lyman, South Carolina - 50 died in the 'gun free zone', no one died where there was a licensed concealed carry. A man with a concealed carry license stopped a shooter after the latter opened fire on a crowd of people at a nightclub in South Carolina early Sunday morning, according to WISTV.com. After getting into a fight with another person, the 32-year-old suspect pulled out a gun and began to fire at a crowd of people gathered outside of the club, hitting and injuring four.